Brea, California, November 13, 2018—Moxa launched its ioThinx 4510 IIoT modular remote I/O. The ioThinx 4510 supports multiple IT and OT protocols, such as Modbus TCP, SNMPv3 and RESTful API, and offers an intuitive configuration tool with an user-friendly web GUI, allowing IT and OT users to copy configuration settings in new modules without any additional reconfiguration efforts required, even if different module combinations exist. Also, no setting changes are required from the devices to the upper software (e.g., SCADA). Moreover, the ioThinx 4510’s built-in Modbus gateway can reduce the complexity of a system. The ioThinx 4510 also addresses great difficulties for OT and IT users. For modular remote I/O setups, one of the greatest difficulties is duplicating configuration settings to the current modules with different module combinations. After adding, moving, or deleting one of the modules, the configuration of the unchanged modules, including the Modbus address and RESTful APIs to the upper software, needs to be reconfigured. Now, users don’t need to worry about it. The ioThinx 4510 supports the most commonly used protocols, including Modbus TCP for OT operations as well as SNMPv3 and RESTful API for IT operations. The ioThinx 4510 retrieves and converts I/O data to any of these protocols simultaneously to fulfill a variety of protocol applications in one device, helping users stock fewer product types and variants, and ultimately streamlining their suppliers. The ioThinx 4510 is designed with an intuitive web configuration tool that supports module/channel unique name. Simply put, the configuration settings, including Modbus address/RESTful channel name to SCADA, will correspond with the specific module. No matter whether users change the module sequence, add, or remove modules, they are not required to do any reconfiguration. They just need to configure the newly added module. What’s more, the modular web configuration tool includes UI design features such as drag-and-drop, so users can tweak the I/O sequence and types intuitively. The feature also applies to Modbus TCP and Restful API protocols. The ioThinx 4510 is not just a modular I/O, but also designed with a build-in Modbus gateway. It supports Modbus RTU Master to help users collect field-site data from serial devices and convert the serial data to different protocols, e.g., Modbus TCP, SNMPv3, and RESTful. This two-in-one design reduces system complexity, the amount of space required in the network topology, and overall installation time. Moxa is a leading provider of edge connectivity, industrial computing, and network infrastructure solutions for enabling connectivity for the Industrial Internet of Things. With over 30 years of industry experience, Moxa has connected more than 50 million devices worldwide and has a distribution and service network that reaches customers in more than 70 countries. 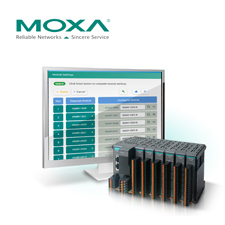 Moxa delivers lasting business value by empowering industry with reliable networks and sincere service for industrial communications infrastructures. Information about Moxa’s solutions is available at www.moxa.com.